December 3, 2017 Deals Post may contain affiliate links, Disclosure here. 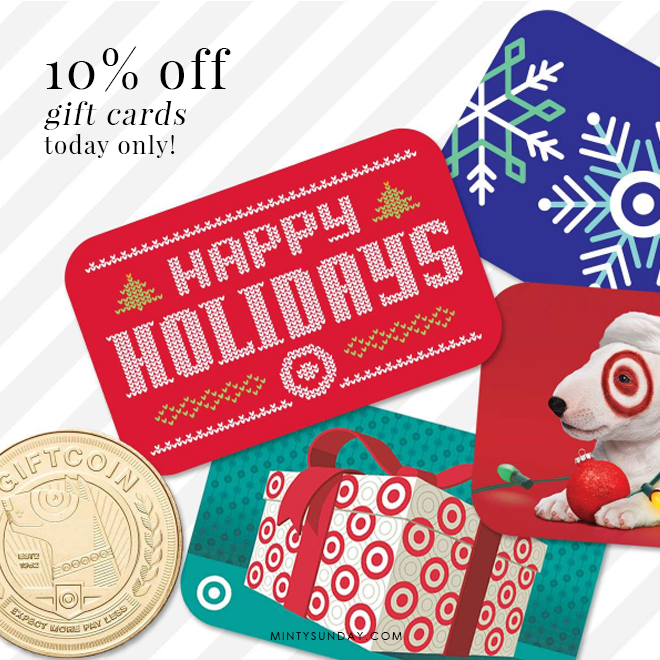 Today only 12/3, Target is currently offering 10% off your gift card purchase available online and in-store. Limit 1 transaction per guest and max discount is $30. So, you can buy up to $300 worth. The minimum gift card amount you can purchase is $10. Gift cards will be redeemable starting 12/4 at 10 am CT. The 10% off your gift card discount excludes Target Visa, Mastercard and American Express gift cards. You can’t use Target gift cards to buy gift cards online. You can’t use your Target RedCard to get extra 5% off. You can get a sweeter deal if you combine this deal with the 20% off coupon if you got one on Black Friday. So buy a gift card to get 10% off, then use the gift card with the 20% off coupon. « Macy’s Friends & Family Holiday Deals Up To Extra 30% Off!